Our product range includes a wide range of 10 metres jointless anti hail net. We are suppliers of High Strength upto 10 metres Jointless Anti Hail nets . 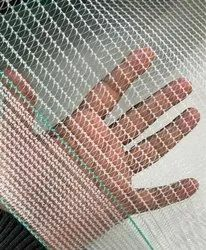 These nets have superior UV resistance of over 5 years and are made of high quality premium grade virgin raw materials. These nets are highly resistant to physical damage and can withstand very strong hail storms and winds . Looking for Anti Hail Net ?